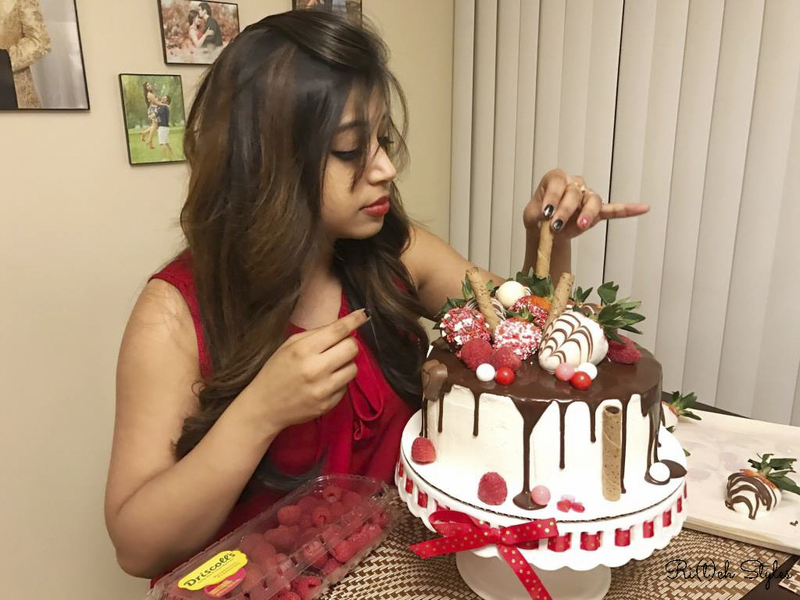 Ri(t)ch Styles : Indian Fashion, Beauty, Lifestyle and Mommyhood Blog: Guest Post : Valentine's Cake Baking! 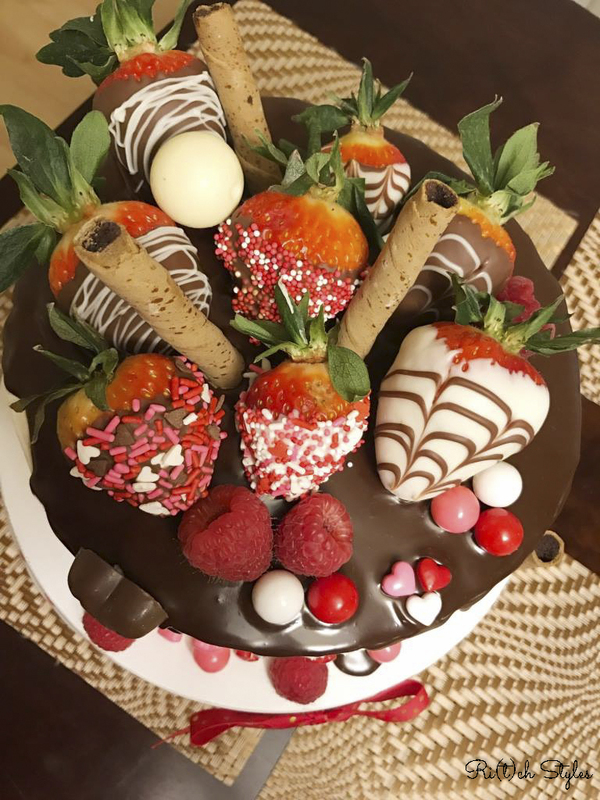 Sunday morning when I woke up and switched on my phone, I was greeted by the most beautiful and yummy looking Valentine's cake on Facebook. 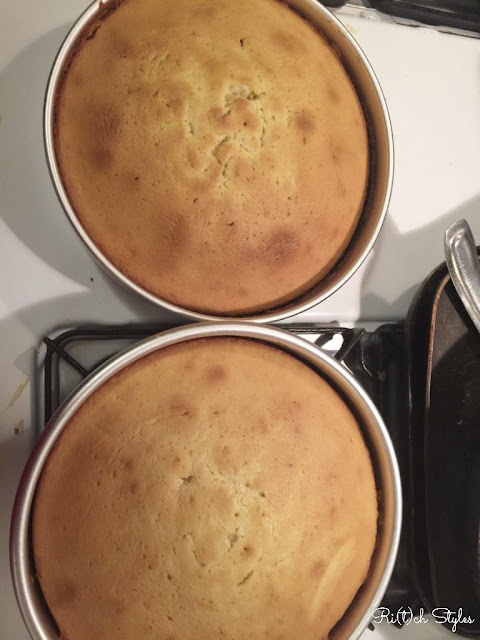 I follow a lot of cooking pages, so for a minute, I thought it was a picture from one of those until I saw that one of my cousins had actually baked that gorgeous looking cake and documented all the steps. 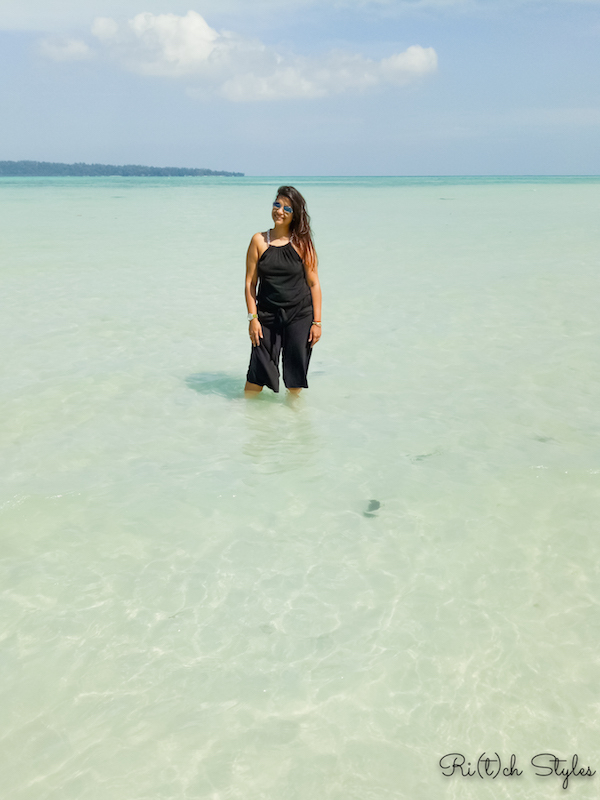 Knowing that it had to be shared with you guys, I pinged her the next moment to share the recipe with me so that I could share it on the blog, and she instantly obliged. 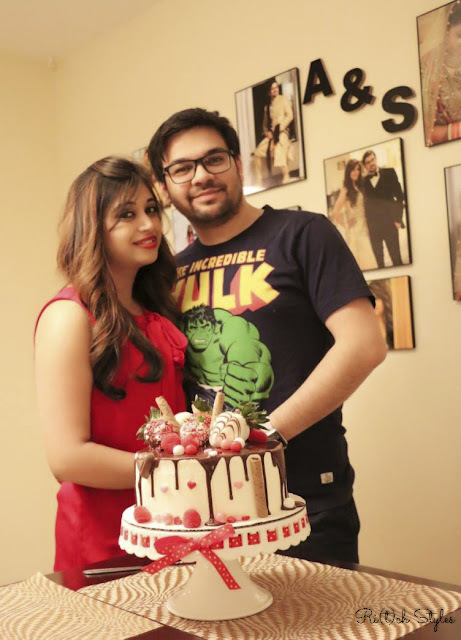 She has done a wonderful job on her first blog post, pictures and all and I am thrilled to be sharing Ashmita's Valentine's cake recipe with you guys. Here is Ashmita's recipe in her own words, with the background as to how the Valentine's cake baking tradition has been started by her and her husband. Baking together for Valentine's Day is a tradition that me and my Husband started last year when it was our first Valentine's as Mr. & Mrs. We dated for a decade before getting married, but that did not stop us from creating new traditions to keep the spark alive in our prolonged yet still new relationship! Neither my husband nor me are avid bakers, and only take it as an adventure once in a while. 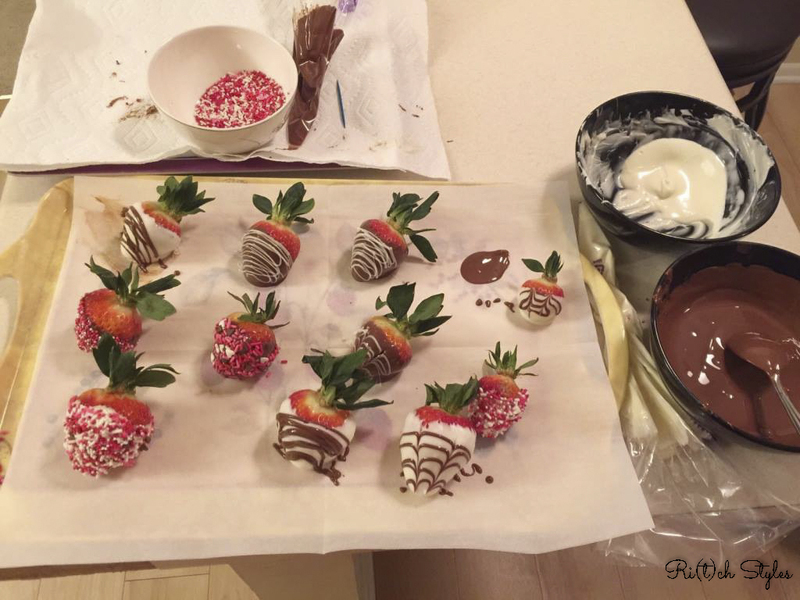 When we did some spontaneous baking last Valentine's, we had a great time together and hence wanted to continue the tradition. 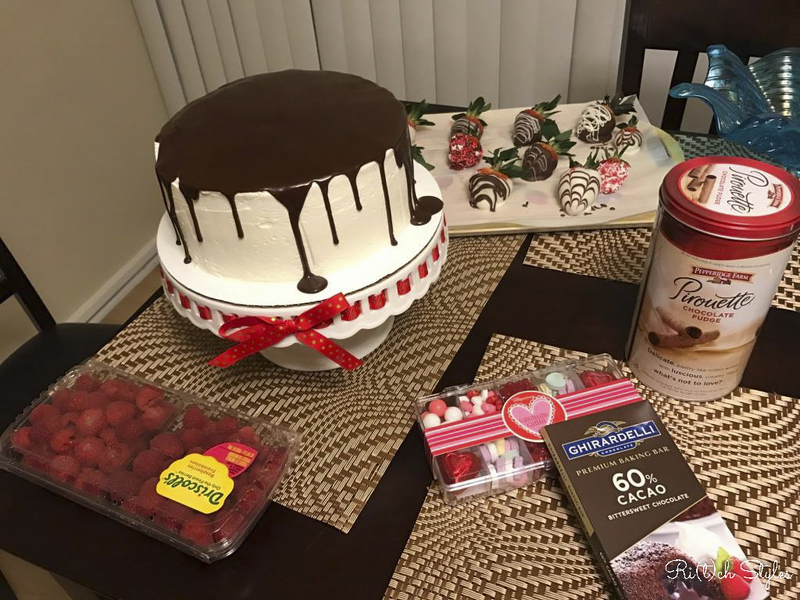 This year was more planned as we got the right tools to make a layered cake with chocolate ganache, and adorned it with chocolate strawberries and some Valentine's candies. 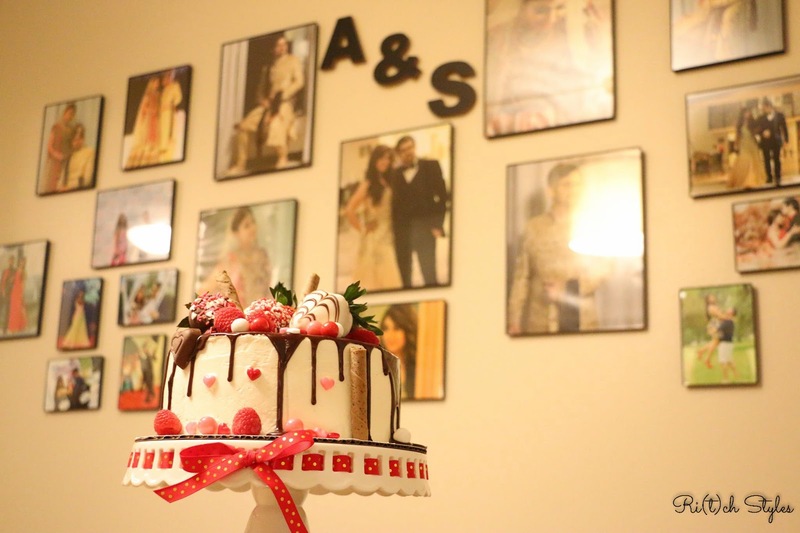 Both of us are working in the US, and hence getting a break from our hectic schedules to spend time with each other while baking, was a perfect start to the Valentine's weekend! Here is what we created in 4 hours on a Saturday night….Time well spent and loved every bit of creating this cake! We started with following a simple vanilla cake recipe at www.joyofbaking.com: www.joyofbaking.com/VanillaCake.html. 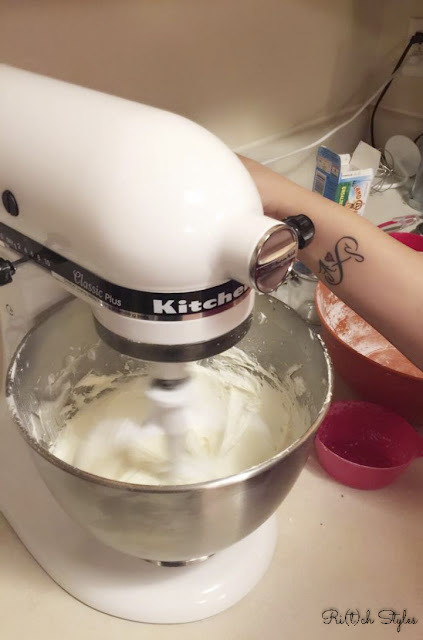 It is important to pay attention to details such as speed of the mixer as you do not want to overdo or underdo your cake mix at any point. Also, sugar can be altered based on taste preference, but using 1¾ cups of sugar brought just about the right level of sweetness. 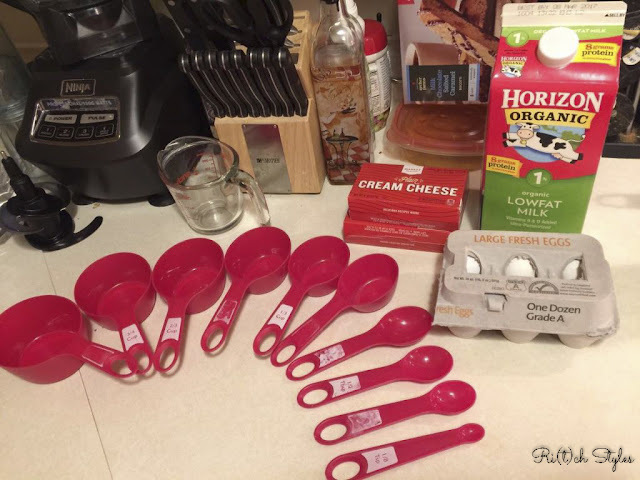 We used eggs as in the recipe, but there are egg substitutes available at confectionary stores that can be used if you are looking to make an eggless cake. We used a Kitchen Aid Mixer as its perfect for preparing the dough. 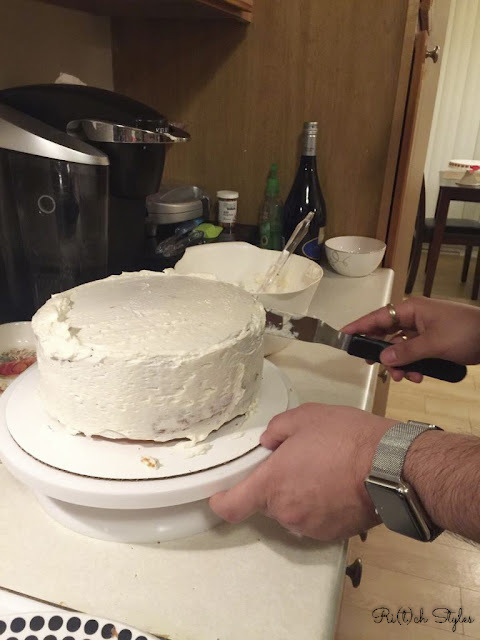 Once our two cakes were ready, before putting them together to form a tall cake, we used a cake leveler to get rid of the uneven surfaces. 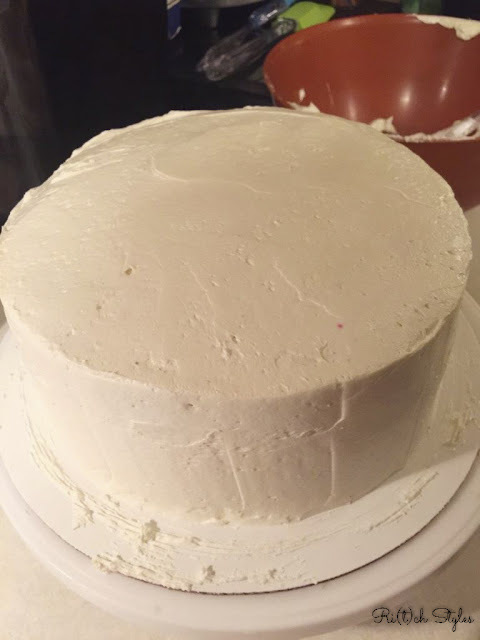 For frosting, it is best to do the first layer and set the cake in the refrigerator for an hour (so that the cake crumbs can settle down), and then do the second/final coat for a smooth finish. We did not use color for our frosting. If you can get one of those cake decorating turntables, frosting can be really easy. 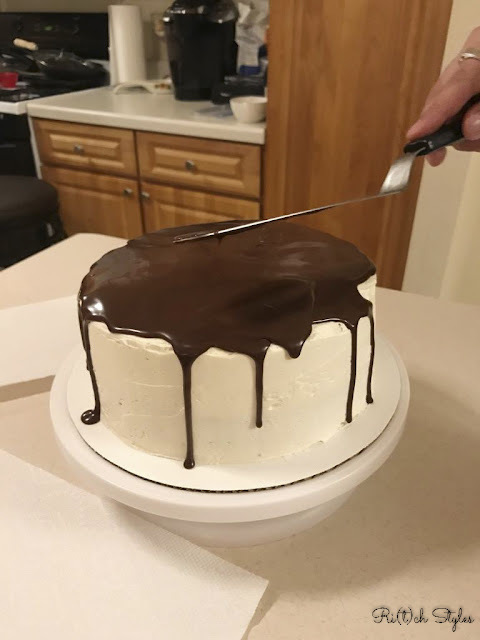 After the second layer of frosting, we set the cake in the fridge for about 30 minutes while we prepared the chocolate ganache. The chocolate ganache can be made using chocolate chips and heavy whipping cream. Recipe can be seen here: www.youtube.com/watch?v=cBfkedNDgEc. 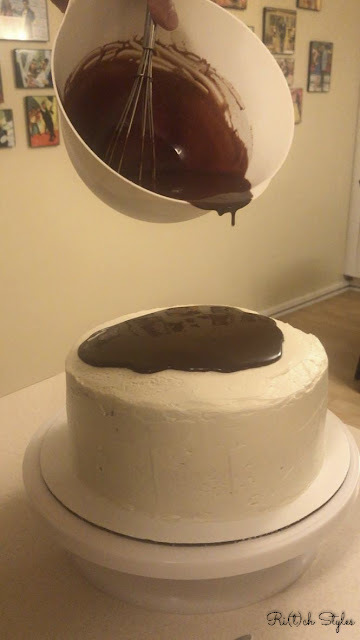 Once the frosting is set, pour some chocolate ganache straight onto the centre point of the cake until the ganache starts to run down the edges. Then pour a little more and spread it with a spatula to even it out. Keep the pressure of the spatula on the cake very gentle, literally just skimming over the ganache. Before decorating the cake, we let the ganache set for about 20-30 minutes. Note that ganache will not be hardened and will be a little flowy, so decorate with a little caution. 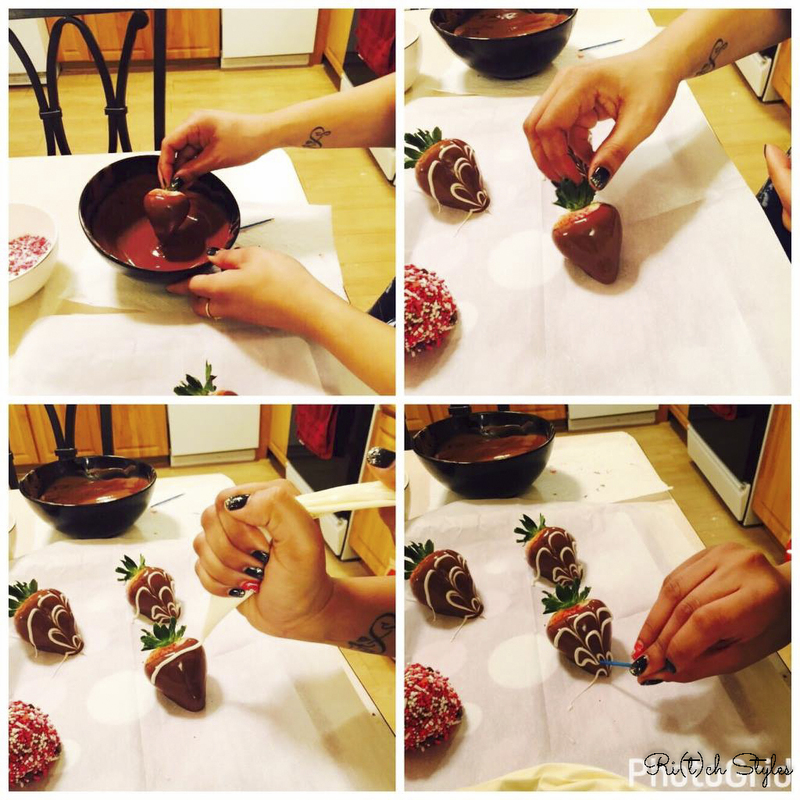 Chocolate covered strawberries are really easy to make and there are numerous recipes and techniques available online for the same. 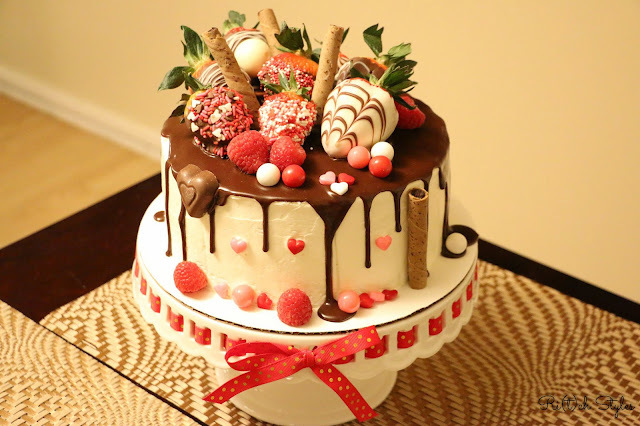 You can also decorate them according to your personal choice which contrasting chocolate flavors, sprinkles etc. Use store available candies to decorate further. And the cake is ready!! Indulging in activities like baking/cooking together helps you realize the potential of teamwork that you and your spouse can bring together to achieve something new and exceptional. Of course, you can always team up with a friend or other family members too as this day is all about spending time with your loved ones! Great pst thanks for sharing this information! !